Biking has become a more popular mode of transportation for many city dwellers. A challenge, however, often lies in finding a bike bag functional enough to store what you need. Maria Boustead, an avid biker in her hometown of Chicago, launched Po Campo so that she could have a bike bag she wouldn’t be embarrassed to carry around wherever she went. 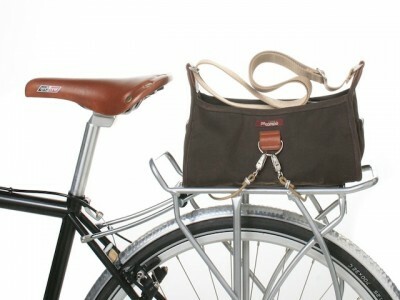 The Streeterville Handlebar Bag style for your bicycle handlebars is perfect for an afternoon ride or a night out on the town. It straps easily onto your handlebars, going from handbag to handlebar bag in seconds. The magnetic closure and handy outer pocket makes it easy to keep your items secure while en route to your final destination. All of Po Campos bags are made to be functional and fashionable allowing you to get where you need to go easily without compromising your own personal style. Biking has become a more popular mode of transportation for many city dwellers. A challenge, however, often lies in finding a bike bag functional enough to store what you need. Maria Boustead, an avid biker in her hometown of Chicago, launched Po Campo so that she could have a bike bag she wouldn’t be embarrassed to carry around wherever she went. The Streeterville Handlebar Bag style for your bicycle handlebars is perfect for an afternoon ride or a night out on the town. 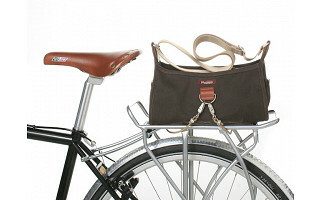 It straps easily onto your handlebars, going from handbag to handlebar bag in seconds. The magnetic closure and handy outer pocket makes it easy to keep your items secure while en route to your final destination.